Aaron Pico breaks silence on suffering a loss in his latest fight under the Bellator MMA banner. Pico suffered a first round KO loss to Henry Corrales in a featherweight bout. This fight served as the co-headliner of Bellator 214 on January 26, 2019 at The Forum in Inglewood, California on Paramount Network and DAZN. As soon as Pico signed with Bellator MMA back in 2014, there was a ton of hype behind him due to his success as an American freestyle wrestler. 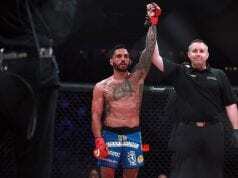 Pico had no easy task in his Bellator MMA debut at the Bellator NYC on pay-per-view event against Zach Freeman in a lightweight bout. This fight did not last long and he lost. Since then, he has gone 4-1. Despite his recent setback, Pico is fired up and expressed his frustration with his performance in this fight during the post-fight presser.